Family Education Rights & Privacy Act of 1974 FERPA, You, & UC. 2 Introduction A federal law, the Family Educational Rights and Privacy Act of 1974 as amended, affords students certain rights concerning their student education records. The law is also known as FERPA and the Buckley Amendment. 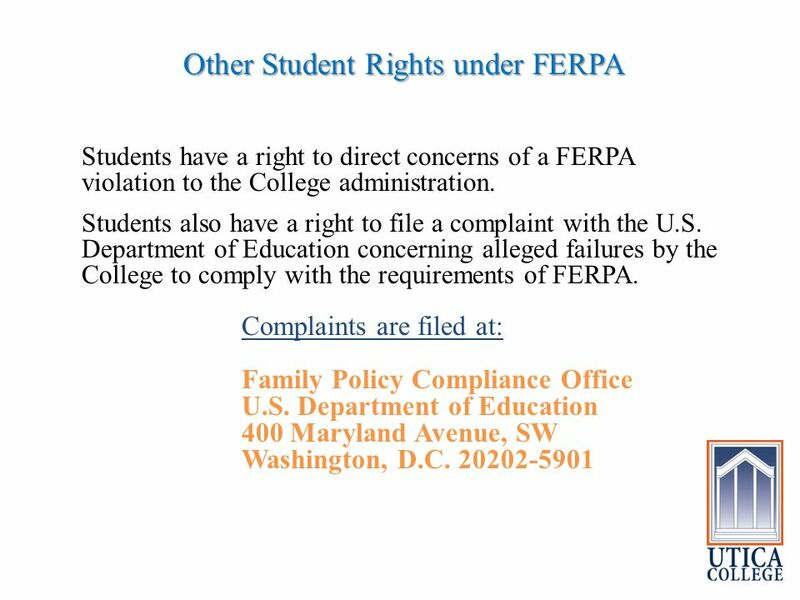 3 Who has rights under FERPA? A student who is or has been in attendance at Utica College, & about whom Utica College has maintained education records. When a student reaches the age of 18 or begins attending Utica College regardless of age, FERPA rights transfer to the student. Admitted students are covered by FERPA only once they have enrolled at UC. We consider a student to be “enrolled” on the day the student begins attending classes. Attendance may be via video conference, satellite, internet, & other electronic information and telecommunications technologies The student does NOT have to be physically present on campus. 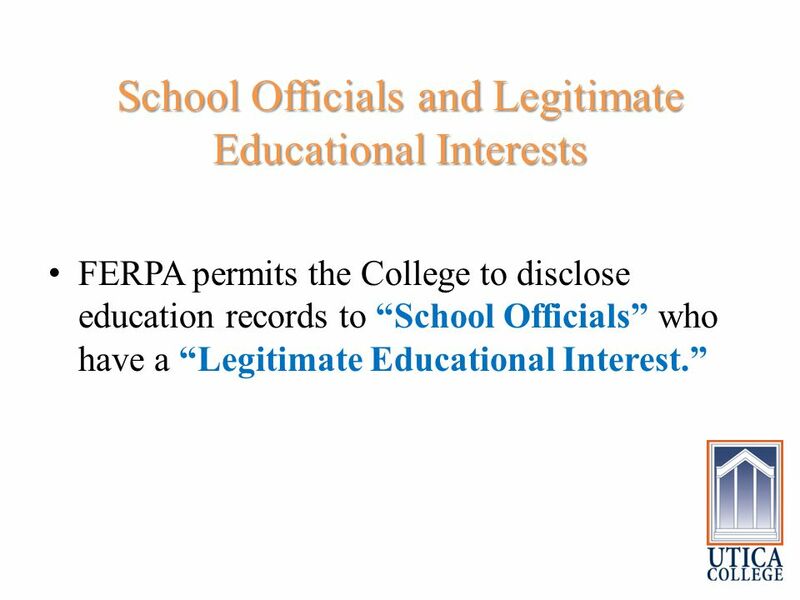 4 Primary Rights of Students Under FERPA Students have a right to know the purpose and content of their education records, and which College offices maintain their education records. 5 Primary Rights of Students Under FERPA (cont’d) Students have the right to request changes be made to education records. Students have the right to appeal a decision of a College faculty or staff member not to make the changes requested. Students have the right to have some control over the disclosure of information from education records. Students have a right to expect that information in their education records will be kept confidential and disclosed only with their permission or under provisions of the law. 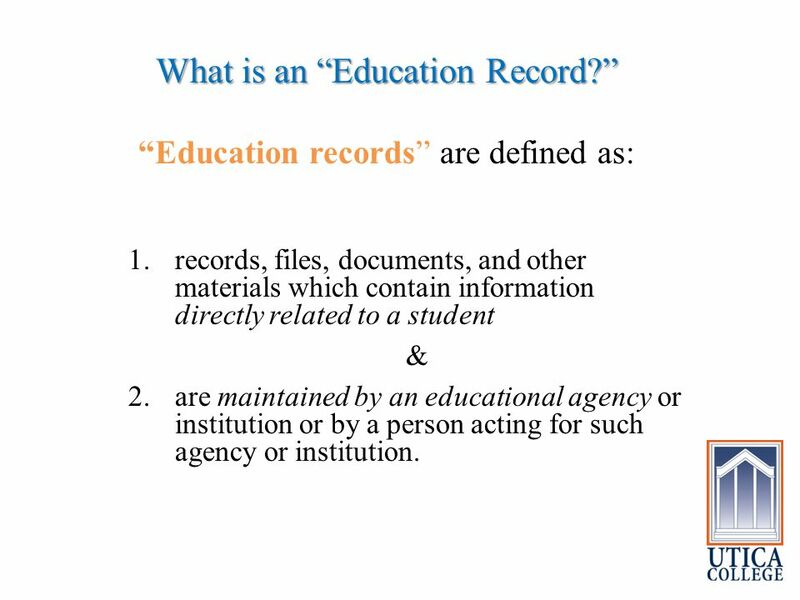 7 What is an “Education Record?” “Education records” are defined as: 1.records, files, documents, and other materials which contain information directly related to a student & 2.are maintained by an educational agency or institution or by a person acting for such agency or institution. 8 Exceptions to the Definition of “Educational Records”: Sole Possession Notes: Notes of a professor or staff member are not considered education records (even if the notes contain information about a student) if the maker of the notes does not share the records with anyone, except a substitute. Once shared, they may become education records. 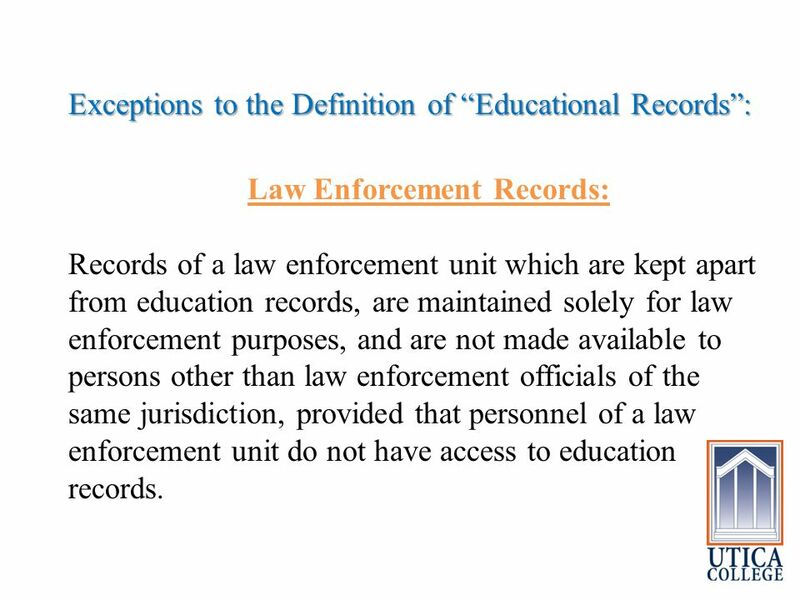 9 Exceptions to the Definition of “Educational Records”: Law Enforcement Records: Records of a law enforcement unit which are kept apart from education records, are maintained solely for law enforcement purposes, and are not made available to persons other than law enforcement officials of the same jurisdiction, provided that personnel of a law enforcement unit do not have access to education records. 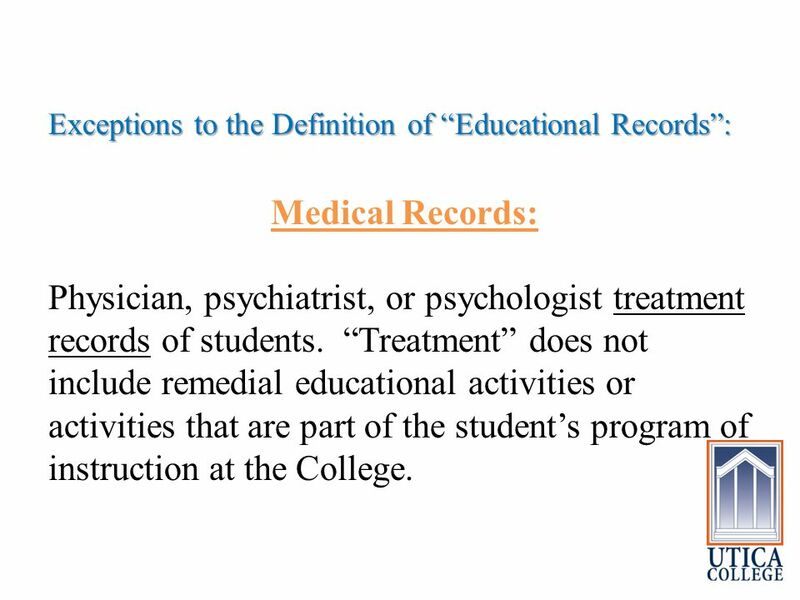 10 Exceptions to the Definition of “Educational Records”: Medical Records: Physician, psychiatrist, or psychologist treatment records of students. “Treatment” does not include remedial educational activities or activities that are part of the student’s program of instruction at the College. 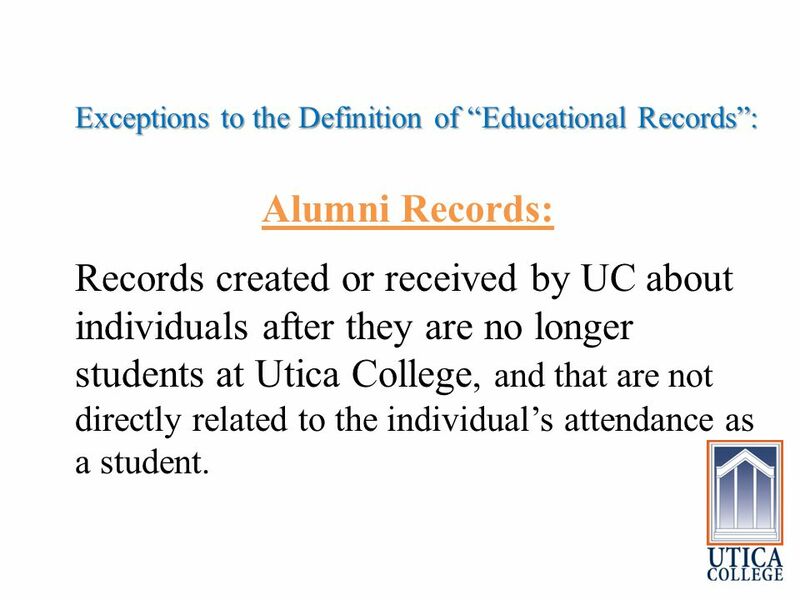 11 Exceptions to the Definition of “Educational Records”: Alumni Records: Records created or received by UC about individuals after they are no longer students at Utica College, and that are not directly related to the individual’s attendance as a student. 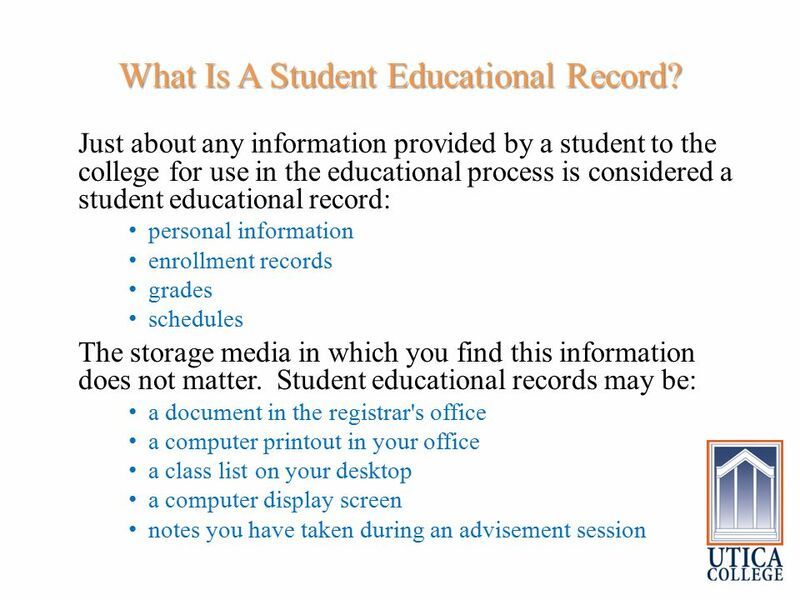 12 Exceptions to the Definition of “Educational Records”: Employee Records: Records relating to an individual who is employed by the College not as a result of his or her status as a student are excluded. 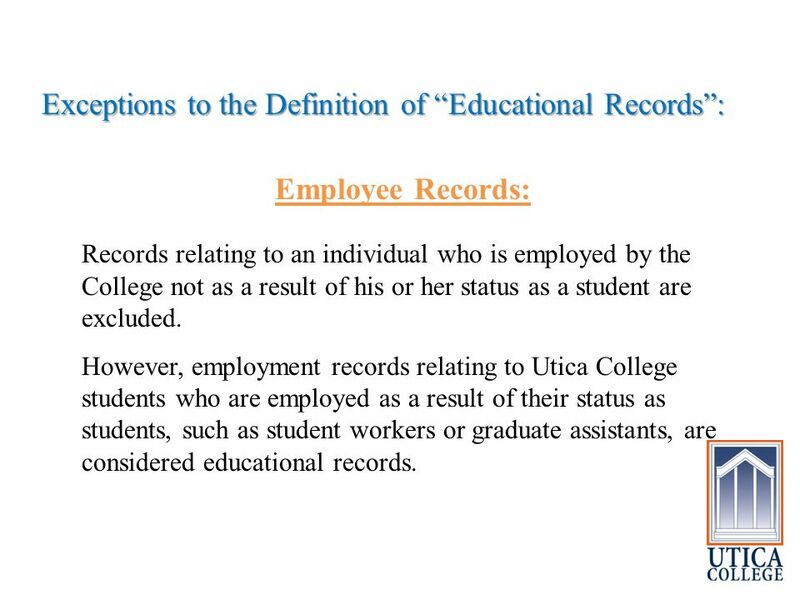 However, employment records relating to Utica College students who are employed as a result of their status as students, such as student workers or graduate assistants, are considered educational records. 13 What About Parents? When a student reaches the age of 18 or begins attending Utica College regardless of age, FERPA rights transfer to the student. 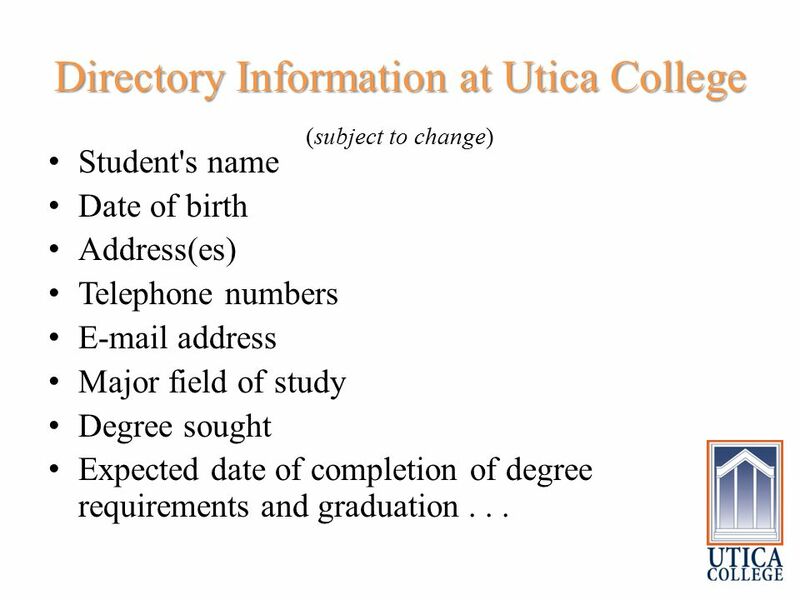 Parents may obtain directory information only at the discretion of the College. Parents may obtain non-directory information (grades, GPA, etc.) only at the discretion of the College AND after it has been determined that their child is legally their dependent. Parents may also obtain non-directory information by obtaining a signed consent from their child. 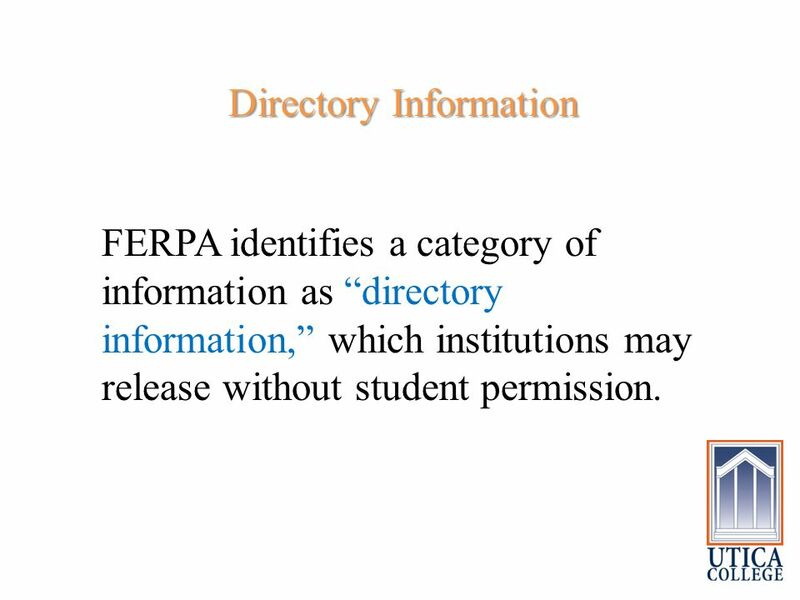 14 Directory Information Directory Information FERPA identifies a category of information as “directory information,” which institutions may release without student permission. 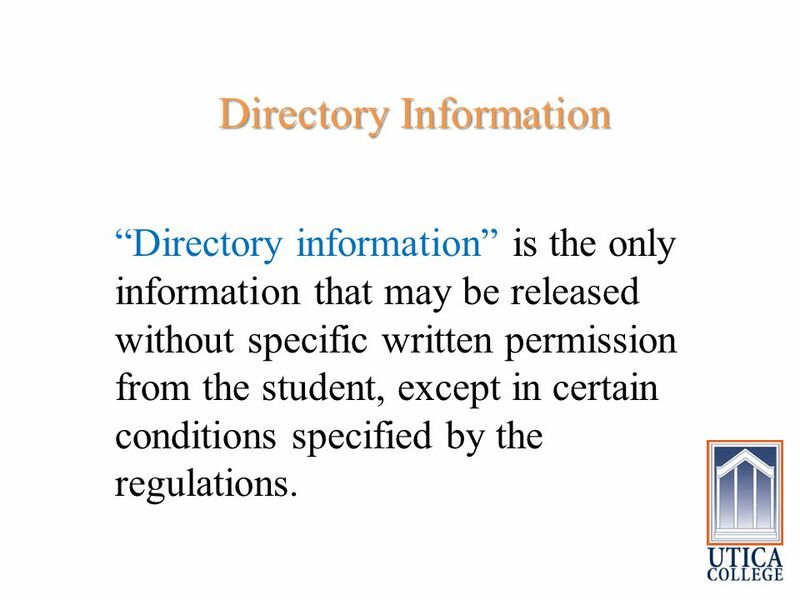 17 Directory Information Directory Information “Directory information” is the only information that may be released without specific written permission from the student, except in certain conditions specified by the regulations. 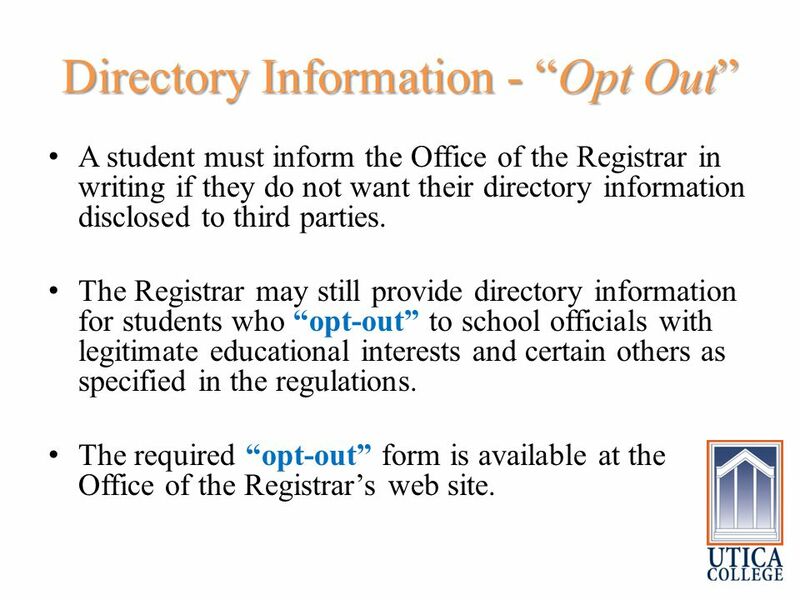 18 Directory Information - “Opt Out” A student must inform the Office of the Registrar in writing if they do not want their directory information disclosed to third parties. The Registrar may still provide directory information for students who “opt-out” to school officials with legitimate educational interests and certain others as specified in the regulations. The required “opt-out” form is available at the Office of the Registrar’s web site. 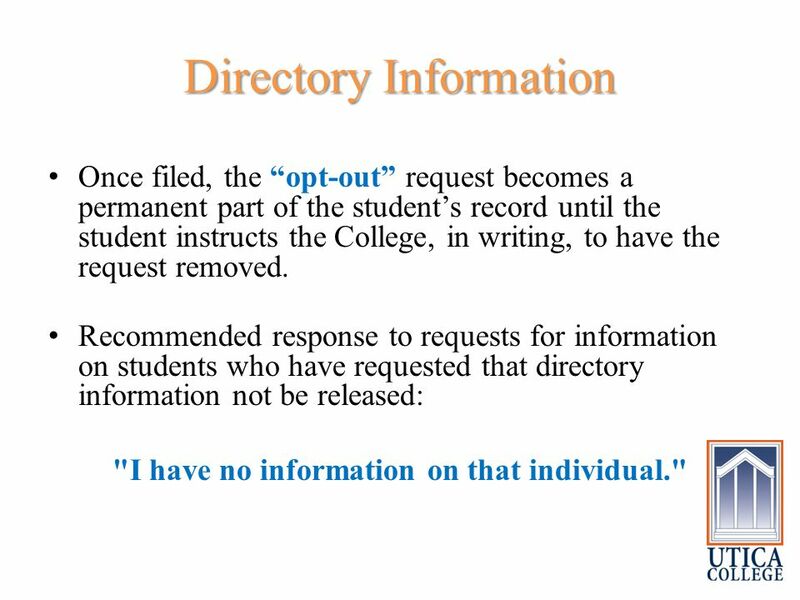 19 Directory Information Once filed, the “opt-out” request becomes a permanent part of the student’s record until the student instructs the College, in writing, to have the request removed. Recommended response to requests for information on students who have requested that directory information not be released: "I have no information on that individual." 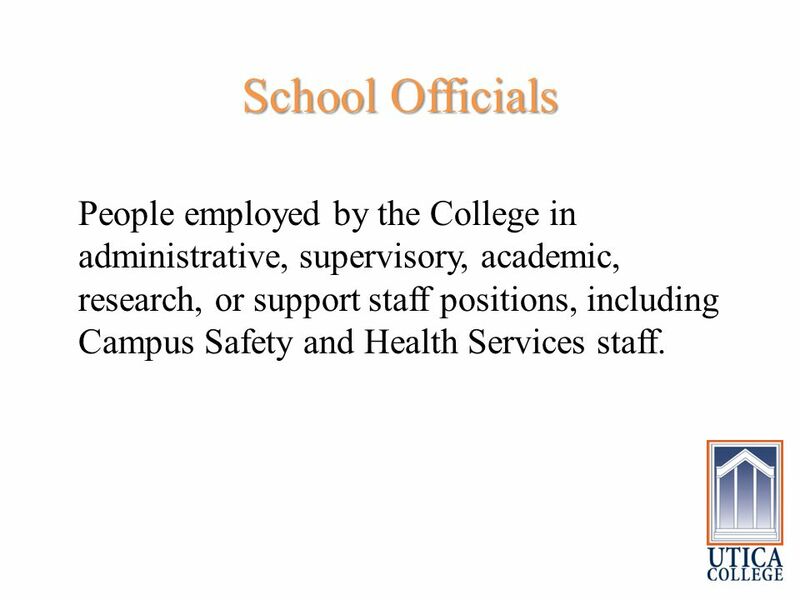 21 School Officials People employed by the College in administrative, supervisory, academic, research, or support staff positions, including Campus Safety and Health Services staff. 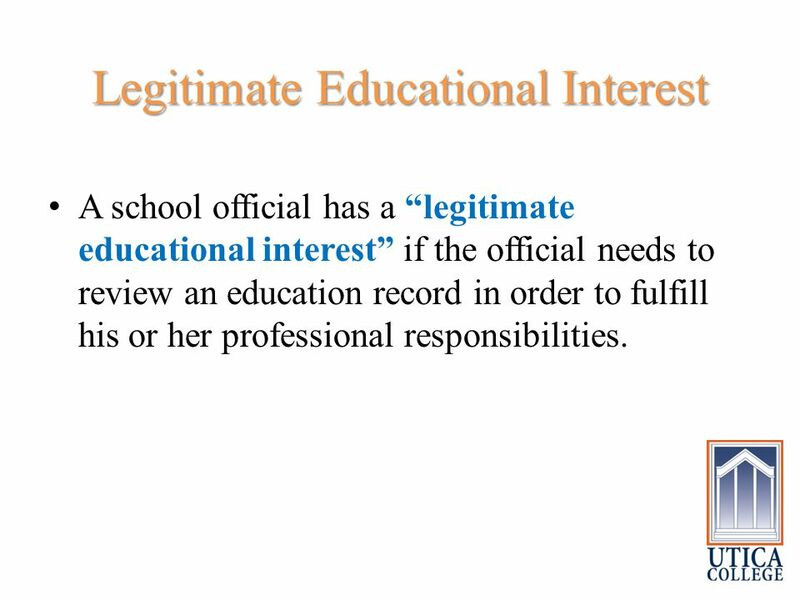 23 Legitimate Educational Interest A school official has a “legitimate educational interest” if the official needs to review an education record in order to fulfill his or her professional responsibilities. 26 What Are The Basic Rules? Student educational records are considered confidential and may not be released without the written consent of the student. As a faculty or staff member you have a responsibility to protect educational records in your possession. Some information is considered public (sometimes called "Directory Information"). This information can be released without the student's written permission. However, the student may opt to consider this information confidential as well. You have access to information only for legitimate use in the completion of your responsibilities as a Utica College employee. "Need to know" is the basic principle. 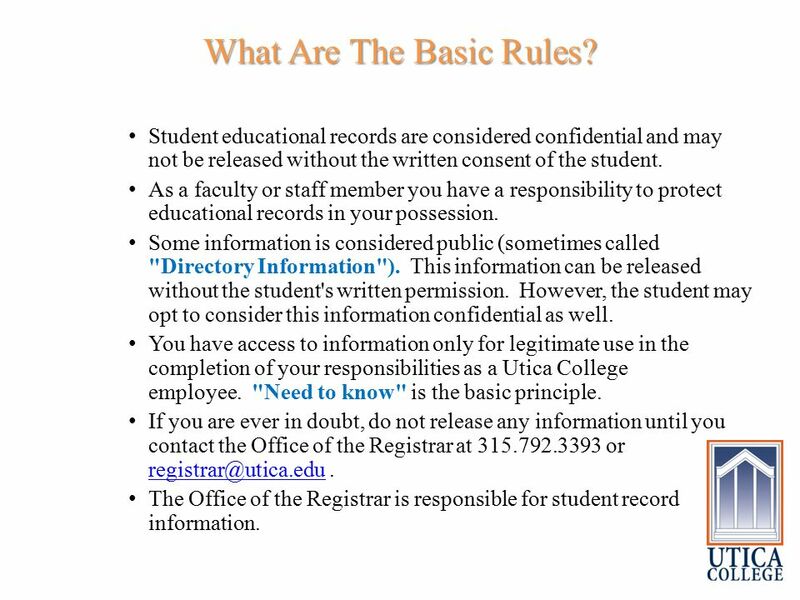 If you are ever in doubt, do not release any information until you contact the Office of the Registrar at 315.792.3393 or registrar@utica.edu. registrar@utica.edu The Office of the Registrar is responsible for student record information. Download ppt "Family Education Rights & Privacy Act of 1974 FERPA, You, & UC." Family Educational Rights and Privacy Act What you should know about FERPA. Family Educational Rights and Privacy Act (FERPA) Basics For Faculty and Staff. Information for Students MGH Institute of Health Professions Use your down arrow or click your mouse to advance through the presentation. FERPA Refresher Training Start. Page 2 of 11 Copyright © 2006 Arizona Board of Regents FERPA Refresher Training What is FERPA FERPA stands for Family. The Family Educational Rights & Privacy Act (FERPA) A course presented for the faculty, staff and administration of Western University of Health Sciences. FERPA UNIVERSITY OF PUGET SOUND OFFICE OF THE REGISTRAR Family Educational Rights and Privacy Act Continue. Protection of privacy for all Students! FERPA What it Means to You, The Instructor. What is FERPA? 1974 – Family Educational Rights and Privacy Act Buckley Amendment Protects the Privacy of. Maureen Cronin Associate Registrar for DARS University of Nevada, Reno. FERPA for Students What Every MSU Student Should Know Prepared by the Office of the Registrar. F amily E ducational R ights and P rivacy A ct University of Nebraska at Kearney. FERPA What You Need to Know as a Wayne State Student Prepared by the Office of the Registrar. FERPA: WHAT YOU SHOULD KNOW ILASFAA April 18, 2008 Amy Perrin Director of Financial Aid Elgin Community College. Office of General Counsel Princeton University FERPA Issues for Princeton Administrators 18282.1.